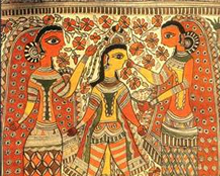 Rich in diversity, Bihari culture is a neat mosaic of three major religions - Hinduism, Buddhism and Jainism - that had defined its literature, arts and crafts, cuisine, architecture and festivals. Gautam Buddha attained enlightenment at Bodh Gaya, a town in the Gaya district that gave rise to Buddhism which spread across the world. Also, Vardhamana Mahavira, the 24th and the last Tirthankara of Jainism, was born in Vaishali around the 6th Century B.C. A Bihari household will usher day with religious piety by the blowing of a conch shell informing the arrival of dawn. While Hindu priests recite mantras in temples, a Buddhist monk uttering a low-pitched chant and a church bell tolls - thus filling the air with a inter-religious mix of prayers from different faiths. Every aspect of life is filled with religious connotations; the state has edifices and structures that narrate a harmonious blend of lifestyles drawn from Hinduism, Buddhism and Jainism. The religious symbols, Gods and Goddesses can be seen in the nook and corner of a place. Moreover, the calendar is filled with festivals and fairs of different faiths living in unity for centuries. People celebrate festivals and religious events with absolute sense of happiness which is shared across communities. The Holy festival is a grand occasion for merrymaking and fun among the Biharis. 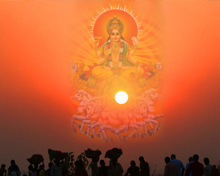 Chatt Puja: This is celebrated twice a year in Chaitra and the next in the month of Kartik. The Sun God is worshipped and people maintain purity of body for well over a month, though the festival is held for four days only. Especially women observe fast during puja for the prosperity of their families. Sama-Chakeva: During winter as birds migrate from Himalayas to Mithila, girls make idols of avian creatures and decorate them. This festival welcomes birds and wishes them to go back to their original abodes safely. Ramnavami: The Hindus observe the birthday of Lord Ram with day-long fasting and prayers. Makar-Sankranti: Known as harvest festival, this ushers in summer time. Also called Tila Sankranti, the poor are fed on the occasion, besides fasting and praying. Bihula: Those living in Bhagalpur district pray to Goddess Manasa for the wellness of the family. Madhushravani: Mithilanchal district observes this festival with joy in order to remind people to follow traditional and religious life. Pitrapaksha Mela: In Gaya district, relatives of the dead offer Pindaadan for the departed soul to attain salvation. Sonepur fair: This is an animal exhibition, one of Asia's biggest, that is held for 15 days as millions visit to buy and sell a range of animals for domestication and business. Shravani Mela: Every year in July-August, Sultanganj hosts this festival of religious importance. A similar festival called Bihula-Bishari Puja of Anga region attracts thousands of people each year. Other major festivals of national importance like Saraswati Puja, Holi, Ramzan, Bakrid, Mahashivaratri, Durga Puja, Diwali, Buddha Purnima, Christmas and Mahavir Jayanti are also celebrated with enthusiasm. The staple foods of Biharis are bhat, dal, roti, tarkari and achar. 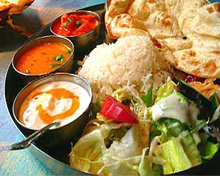 It is prepared from rice, lentils, wheat flour, vegetables, and pickle. And mustard oil is used liberally to cook food. Most Hindus in Bihar consume khichdi, a broth of rice and lentils seasoned with spices and usually served with side dishes as their mid-day meal during the weekend. However, the favourite dish of Biharis is Litti Chokha. While Litti is made up of Sattu, Chokha is a mix of smashed potato, tomato and brinjal. Apart from these, Biharis prepare a range of dry fruits that are mostly made in areas in and around Patna. 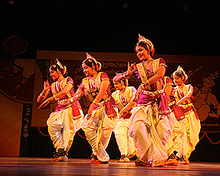 Bihar has ancient tradition of melodious folk songs that are rendered on family occasions like marriage, birth ceremony and numerous festivals. Womenfolk sing them in groups without any major instruments, though at times a tabla, harmonium, bansuri or a dholak is used by them to add momentum to the chorus. During Holi, songs known as phagua rent the air with funny notes. Usually done on newly plastered mud wall of huts. Over the years, this painting graduated into broader canvases like cloth, handmade paper and other medium. The painting narrates the long association between man and nature, beautiful landscapes, Hindu deities like Krishna, Ram, Shiva and Durga from ancient literature. The planetary objects like the sun, moon and religious symbols like tulsi plant are also painting on a range of canvas, apart from scenes in royal court. Bronze sculptures, statues: These artefacts date back to Mauryan kingdom which patronised many arts and crafts. The pillars of Ashoka and Didarganj Yakshi are more than 2,000 years old and carved out of single rock. It is common to see a multiplicity of statues and carved artefacts in all districts of Bihar representing its hoary tradition and heritage. Hindu temples of Mauryan dynasty, Buddhist stupas, monasteries, Mughal edifices, Indo-Islamic and Indo-Sarasenic architectures are most visible even in the present day Bihar. Royal priest Chanakya, in his treatise Arthashastra, suggests the use of brick and stone in building structures to ensure their durability. Many stupas in Nalanda and Vikramshila were originally built with the process of brick and masonry during the reign of Ashoka. The Buddhist stupa, a dome shaped monument, was first used in Bihar as a commemorative structure used for storing sacred relics and later on became popular in Southeast Asia as Pagoda. Buddhist style blended with Roman and Hellenestic architectures to give rise to a unique blend called Greco-Buddhist school. The Persian influence in architecture is the result of Mughal invasion starting from 12th Century. Sher Shah Suri and his successor created some elegant like Sher Shah Suri Tomb. Likewise Makhdum Daulat mausoleum (1616) showcased Persian architecture. The Maner Sharif building has its wall decorated with intricate designs and applique works and a big dome on top and the ceiling are full of inscriptions from Holy Quran.